Artificial Stress | Sentinel Security Group, Inc.
One semi-auto weapon handling challenge that can quickly be overcome with shoot-house training is the need to quicken ones recognition of holding an empty or cycle-stopped weapon. Working through common problems under the addition of artificial stress can produce sobering reality checks for firearms ‘veterans’ and at the same time create tremendous leaps in competency for new defense shooters. To condition any response to become automatic – at the appropriate moment – you must learn that response in an environment that most closely simulates an actual situation that would warrant such a reaction to a real threat. It’s not after basic marksmanship has been established in a student, but during the student’s first moments with a weapon that we begin instilling a rationale for developing the ability to move, shoot, and reload while searching for cover, concealment and better angles of fire. 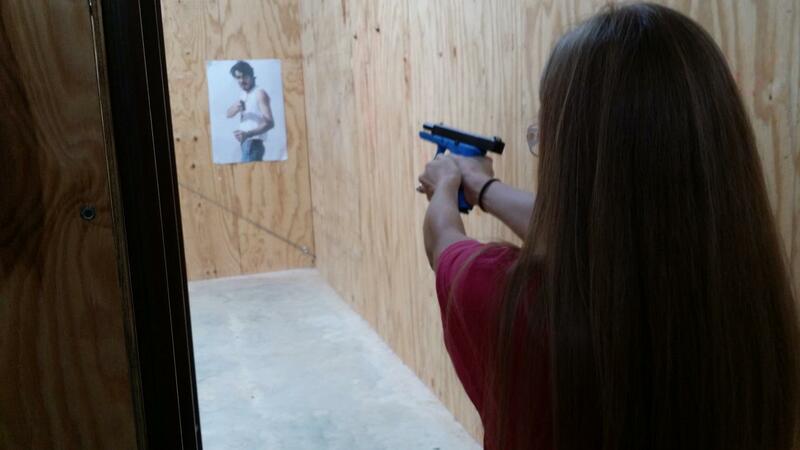 In this picture a Sentinel Training student is seen practicing quickening her recognition and correct response to several problems at once: the need to engage an aggressor, the need to stay behind cover, and the need to quickly complete a magazine change.